One concept of 'faceting' is to display data in separated maps (known as panels), so to emphasize groups or subgroups of data. For example, each panel can represent a timestamp (commonly used to represent historical climate data). 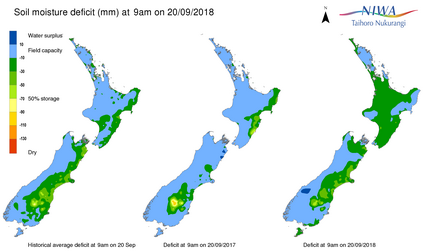 Here is one example from New Zealand's National Institute of Water and Atmospheric Research. First time I came across 'faceting' was with R package ggplot2. For instance, see Overlaying a polyshape to faceted maps in R with ggplot? (more examples can be found in Google, link). Moreover, as pointed out by Steven Kay, another term for 'faceting' is small multiple maps. Indeed, a quick search in Google also returned many true positives for it. Not the answer you're looking for? Browse other questions tagged layers cartography visualisation display terminology or ask your own question. What is the best way to visualize subsurface drillhole and borehole geology data within ArcGIS? What does map scale refer to in map making / field survey metadata? What does “Handle bad layers” mean?